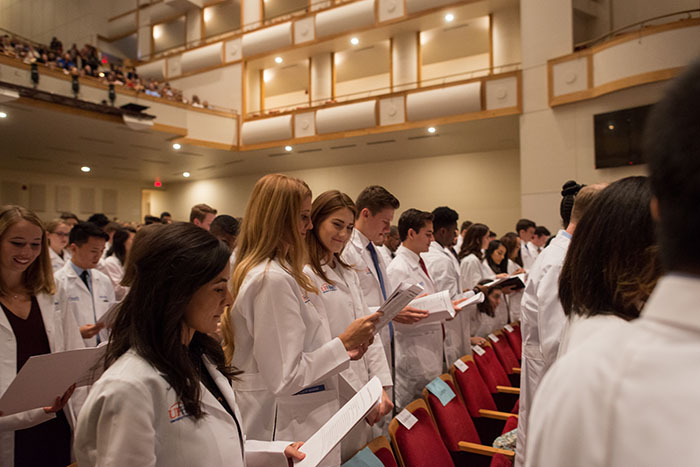 Nov. 20, 2018 — The Curtis M. Phillips Center for the Performing Arts buzzed with excited chatter Sunday afternoon as family members and friends of the UF College of Medicine class of 2022 gathered to watch their loved ones don their white coats for the very first time. When the distinctive sound of bagpipes rang out, the room immediately fell into silence. The slow gait of bagpipe player Joe MacKenzie, combined with the wall of sound his lungs produced, signaled to the audience that something special was about to begin. 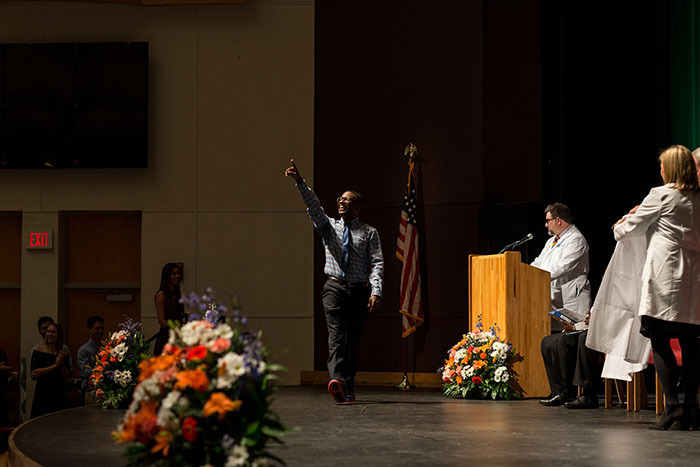 In a moment, the doors to the Phillips Center burst open and the class of 2022 filed into the room in two rows. The bagpipes swelled triumphantly, mirroring the crescendo of the clamoring crowd. The 22nd annual Mark S. Gold, M.D. 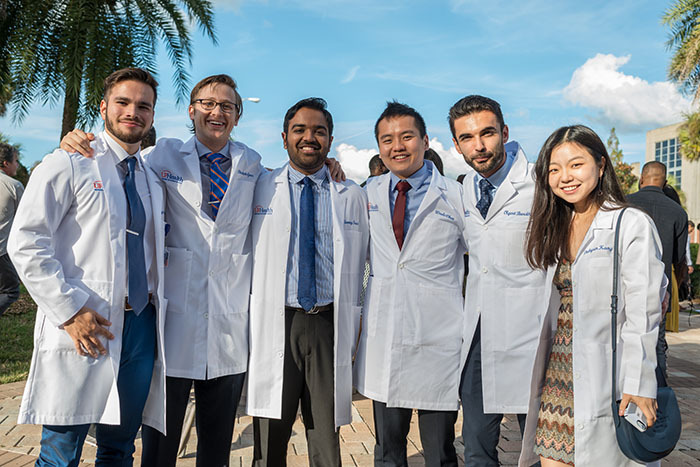 ’75, Distinguished Professor and Alumnus White Coat Ceremony marked an important milestone for first-year UF College of Medicine students, who received their white coats and stepped ever closer toward their dreams of becoming physicians. 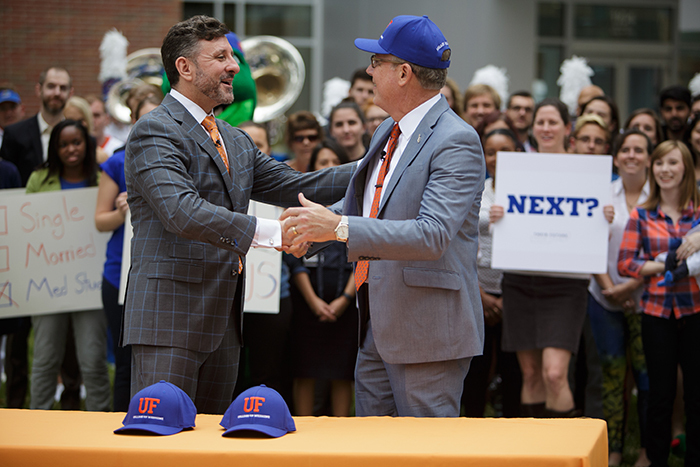 Duff chronicled the evolution of the ceremony, which began 22 years ago in a ballroom in UF’s J. Wayne Reitz Union, attended only by students. 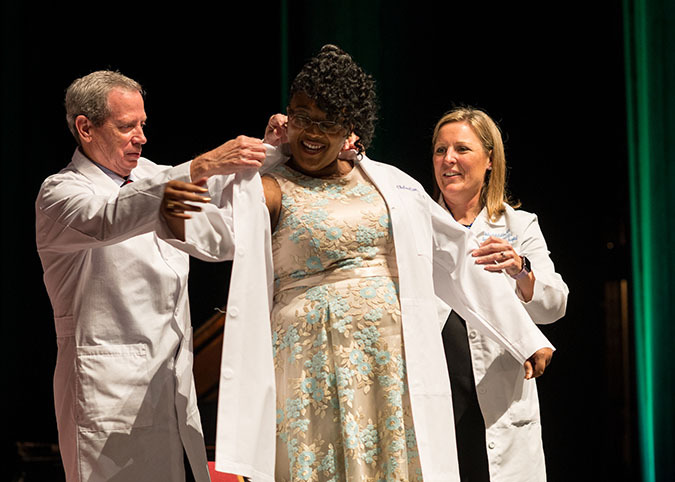 Today, the ceremony attracts faculty, friends and family members of first-year students and is live streamed for loved ones who are unable to attend. 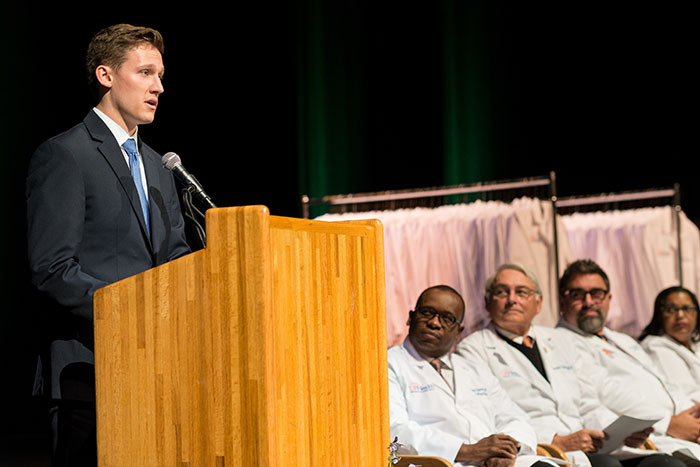 Duff noted the ceremony marks a similar evolution in the careers of the medical students. With this step forward, he noted, comes great responsibility. 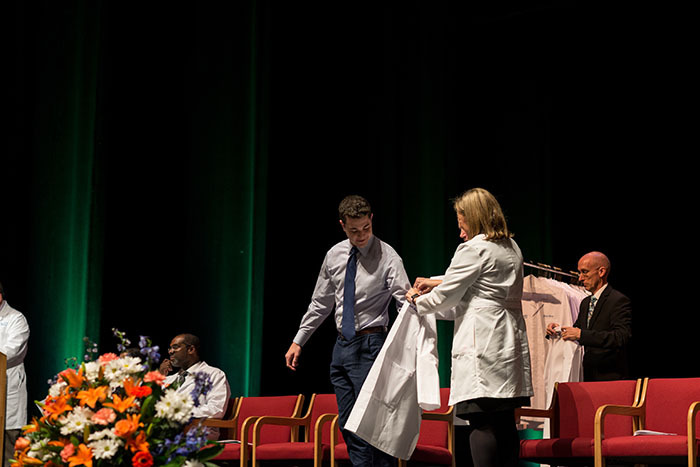 “When donning your white coats today, it should represent your commitment to honor and truth in your candidacy,” Tyndall said. 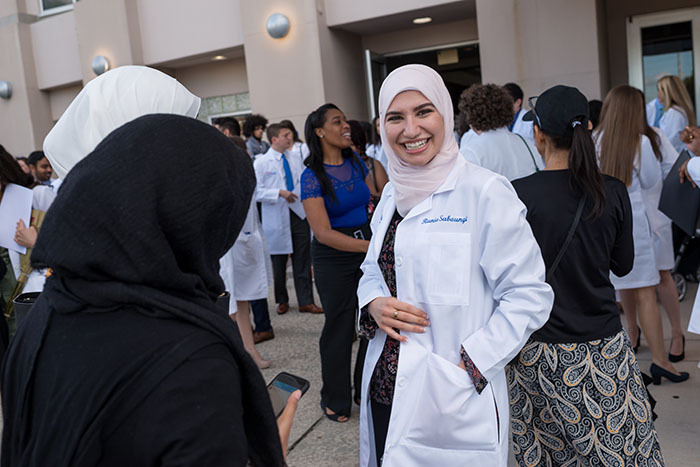 After each student walked across the stage to receive their white coat, snap photos with faculty members and recite the UF College of Medicine code of ethics, the crowd poured into the Phillips Center front lobby to extend their warm wishes. 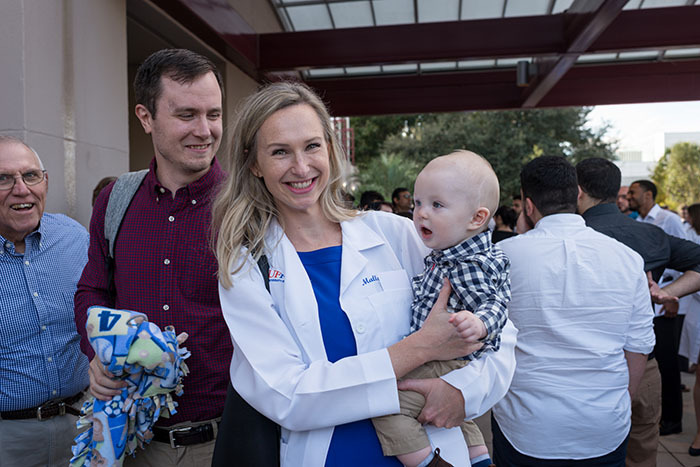 Whitman Wiggins, clad in his brand-new white coat, posed for photos with his family. 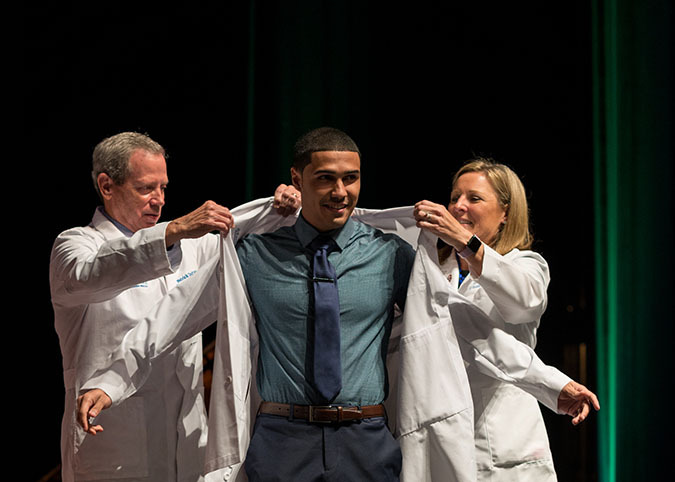 “The white coat is a good reminder of the unique opportunity we have to care for other people and to study the art and science of medicine,” he said.